With such a high probability of data compromise the need for a higher level of security is quickly arising, and when it comes to even basic authentication being added to a web application, such task can no longer occupy the backseat, but rather it needs to be at the front center. 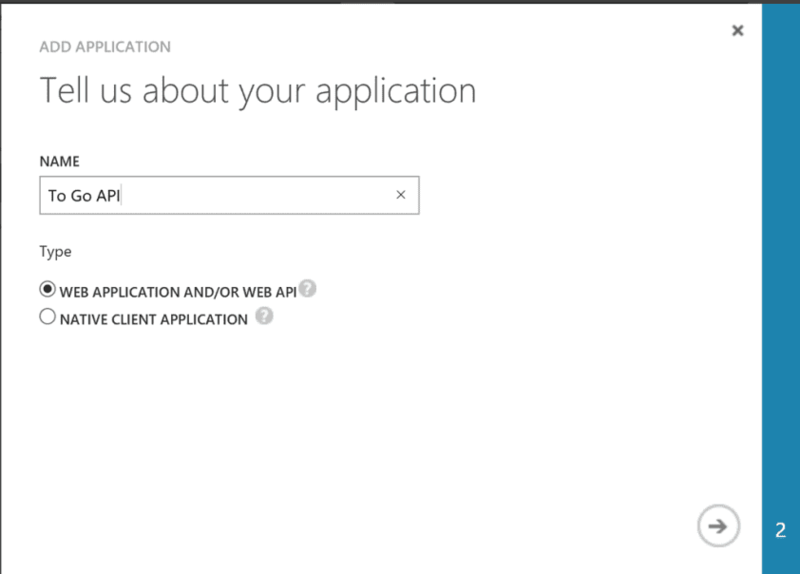 So if you are a developer that needs to ship your application on time but wants to make sure things are secure and trustworthy, what can you do? Thankfully, I believe there is a good solution these days that provides a high level of security and it opens up future extension points that can maximize your development investment and perhaps even give the application a higher competitive advantage. 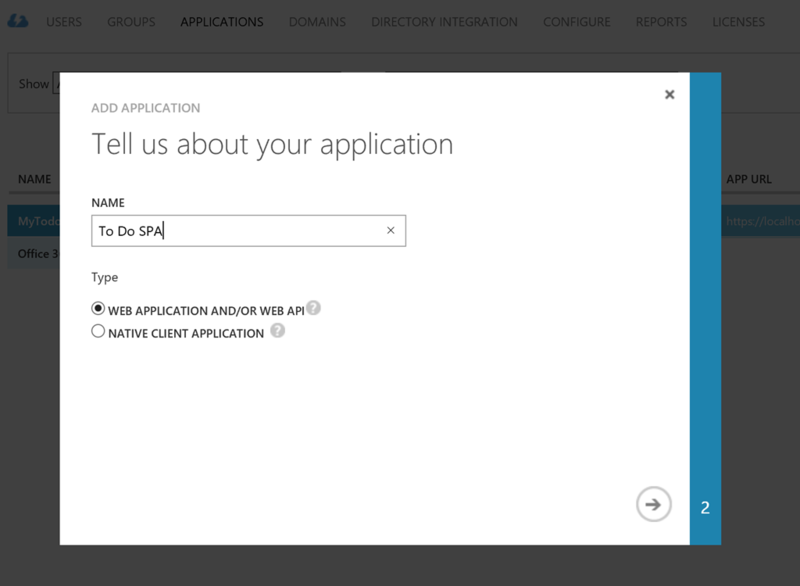 I am referring to Azure AD. 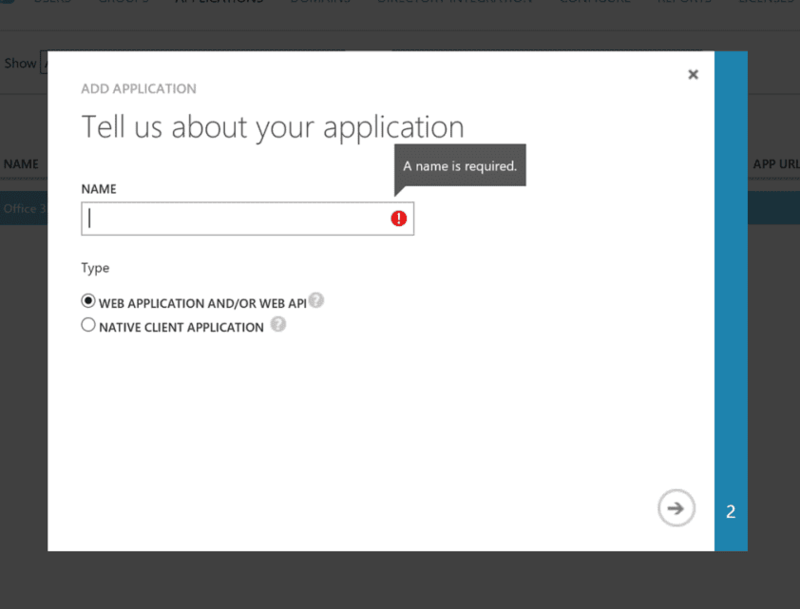 We’ll first proceed to configure the application. 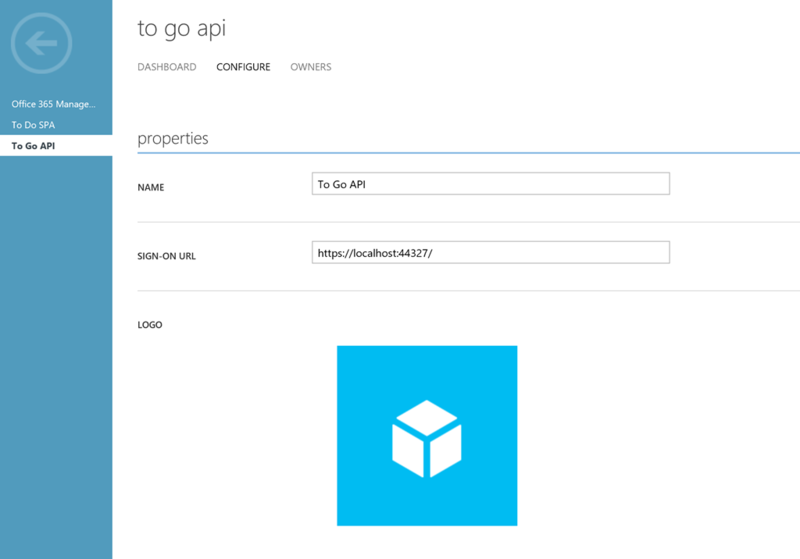 The first thing to do is to head over to Azure AD and create a new Azure Directory, if you already have one and you would like to use it then that will work fine. 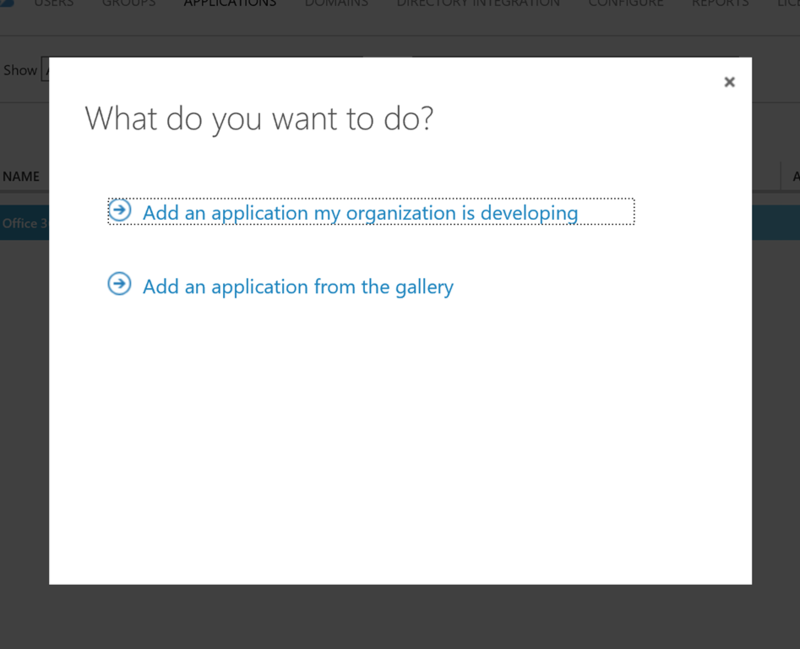 The following steps are similar to the ones shown on the GitHub documentation for this particular Microsoft example, I am simply expanding on them a bit. I am also going to assume that you have not done this before, so I will strive to provide as much detail in each step as I can. 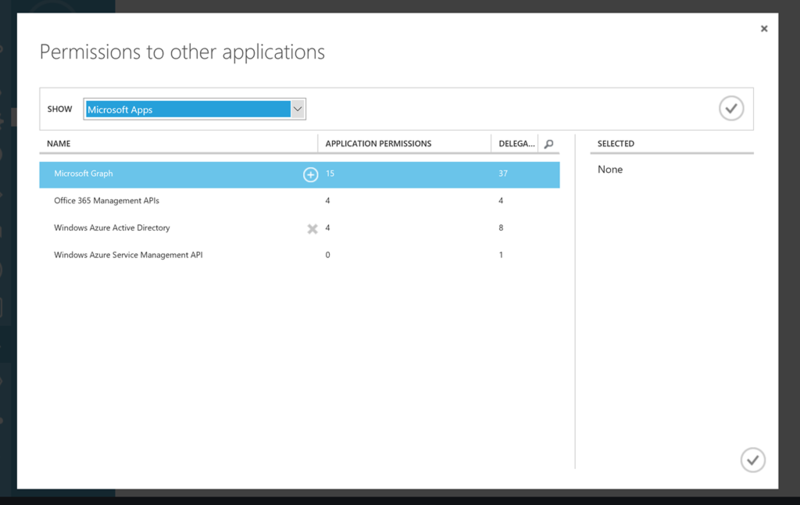 Now that we have decided on our Azure Sample AD (Active Directory), we are now going to create the application settings. On the Azure AD page you will see an Applications tab, click on that tab. 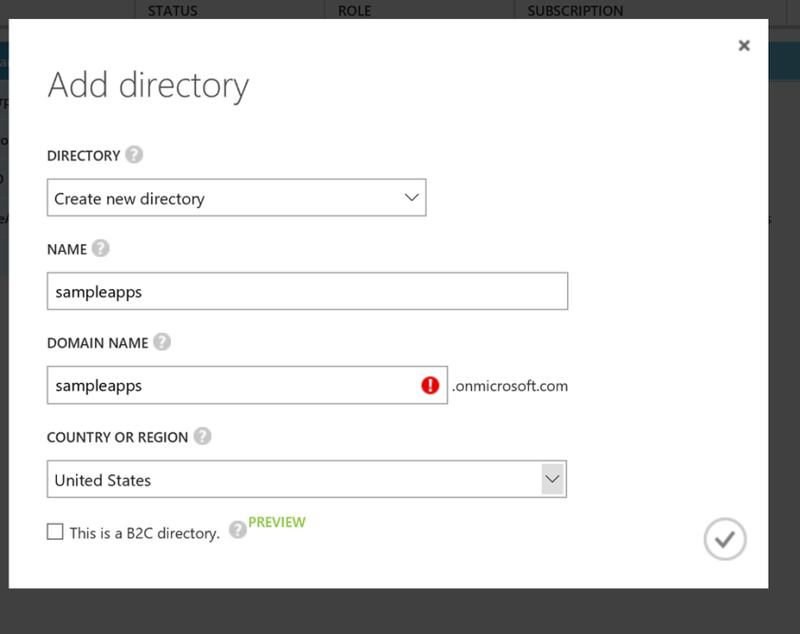 Notice that if you have an Office 365 Subscription, you will already see that entry as an App on this page. 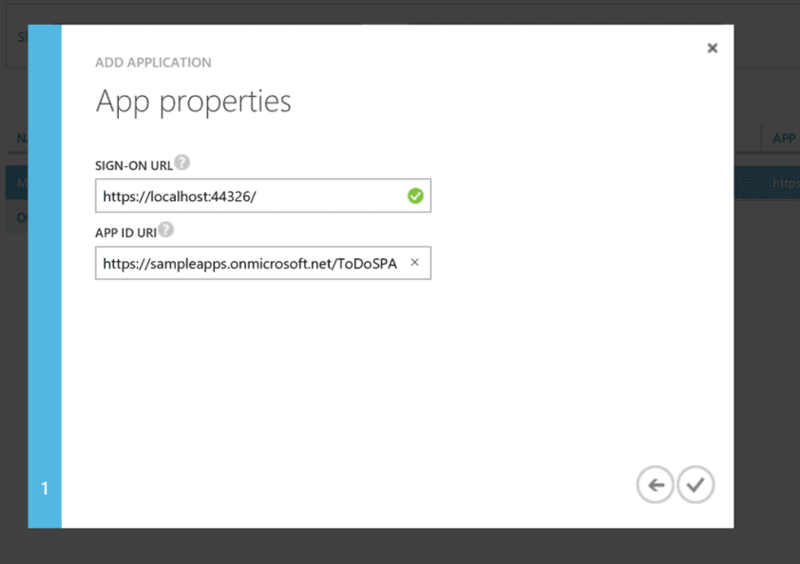 That is because Office 365 leverages Azure AD, but that is a topic for another time. The next piece of configuration on this next screen is the App ID URI. 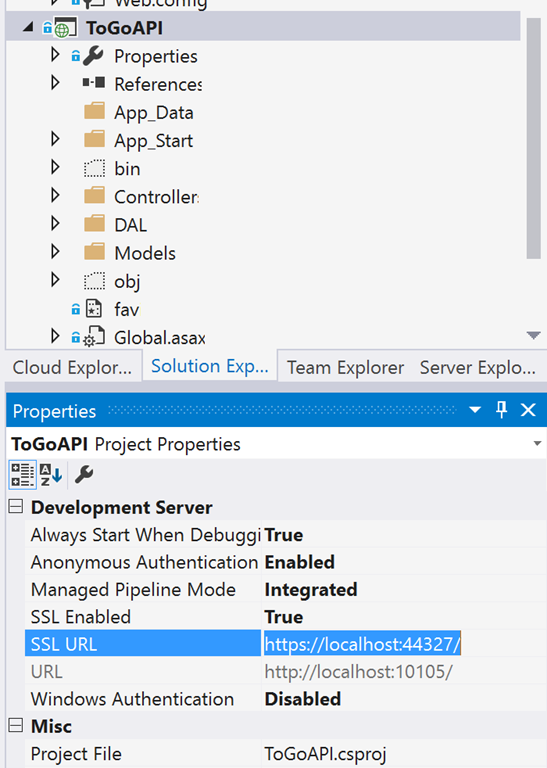 This is simply your tenant name followed by your application name in this format: <a href="https://<your_tenant_name>/ToGoAPI">https://<your_tenant_name>/ToGoAPI</a>. 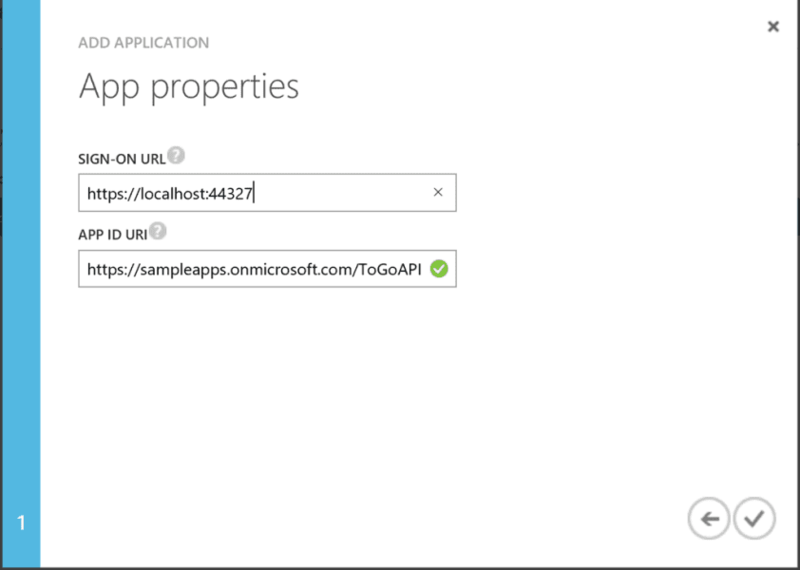 Simply replace <your_tenant_name> with the Azure AD tenant name you created earlier. 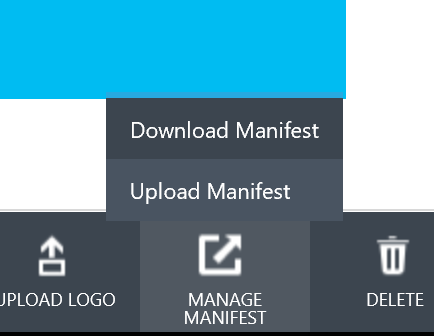 Once you have filled the information, save it and move to the next stage. 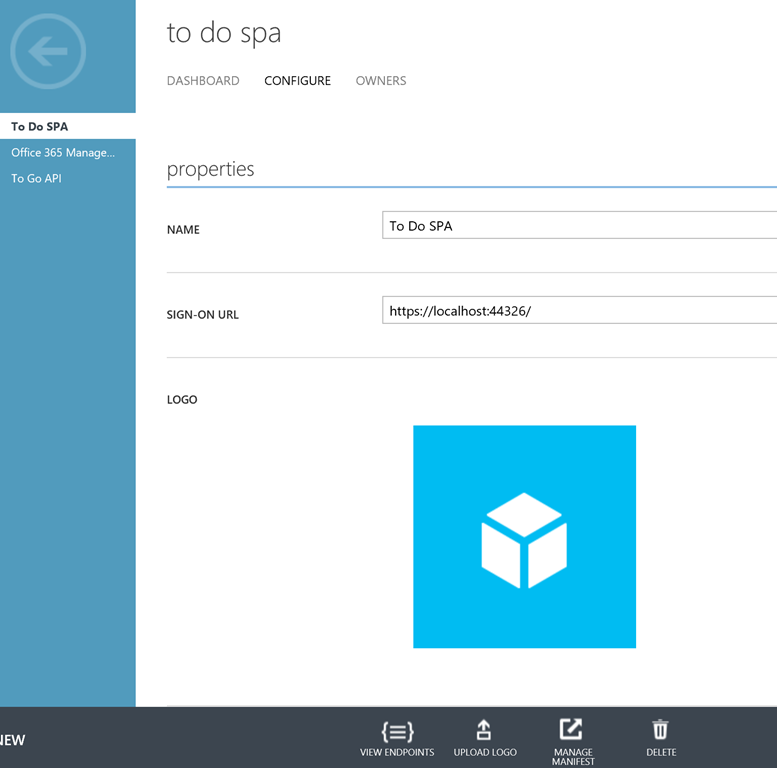 The previous steps walked you through the process of registering the TodoAPI, now you will need to follow the same process to register the TodoSPA application in Azure AD. 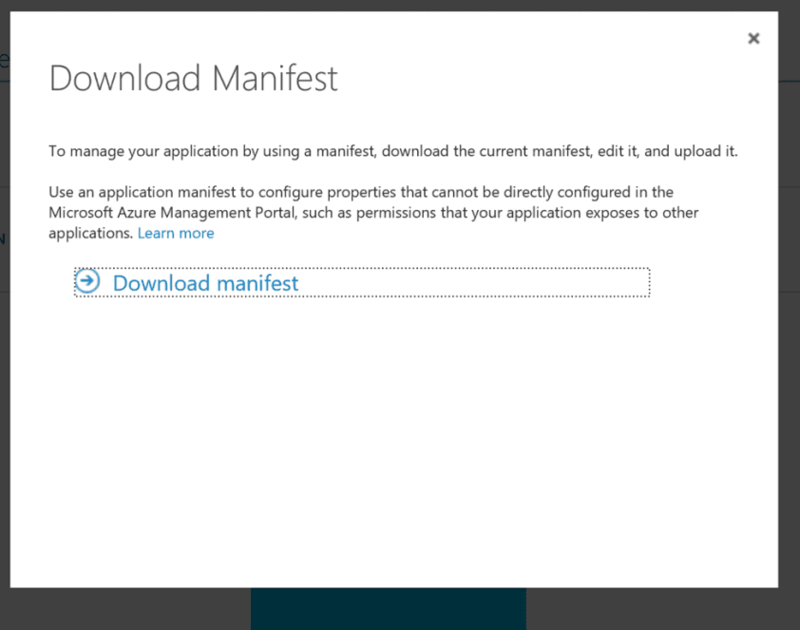 So head back to the Azure management portal, make sure you are again within the Directory where the sample application configuration lives. 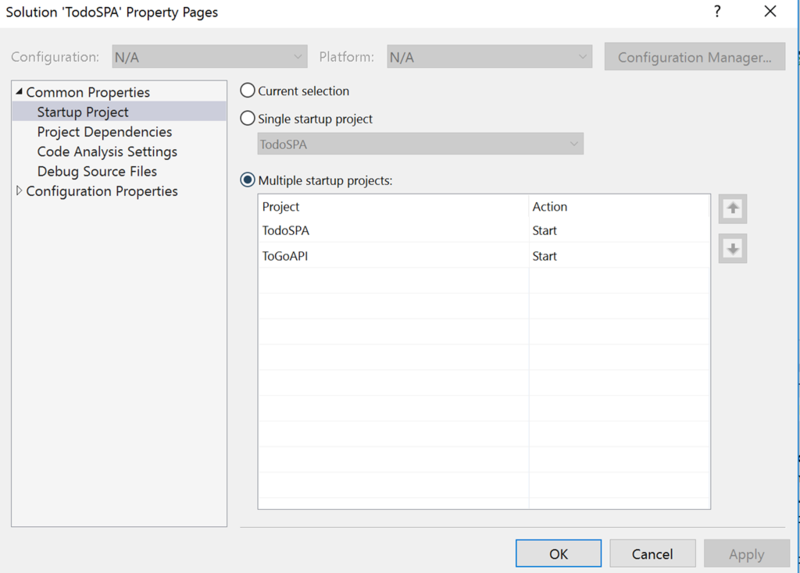 Click on the Add application button, you will see a new screen pop up title Permissions to other applications, here you will add the To Go API application permissions. 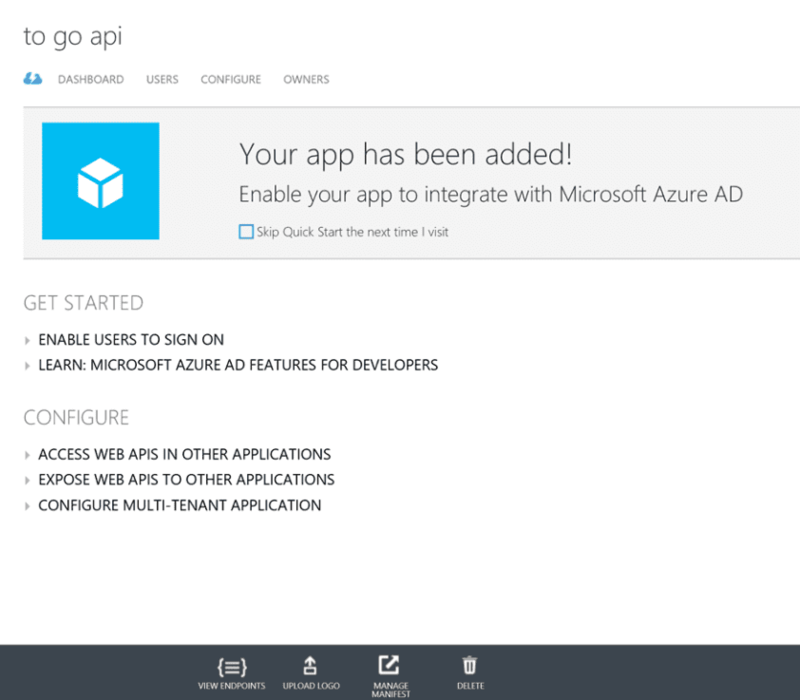 Now, this particular UI is less than intuitive in my opinion, so I will briefly walk you on how to add the ‘To Go API”. In a real world application you may not want to use the setting for CorsOptions.AllowAll, but this will suffice for this example. 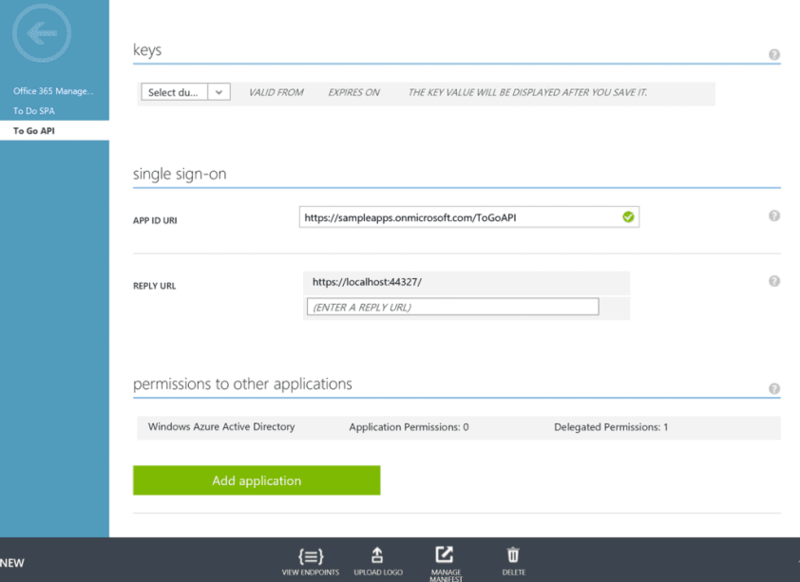 There is one more configuration step that needs to be done in Azure AD in order to make all of this work. 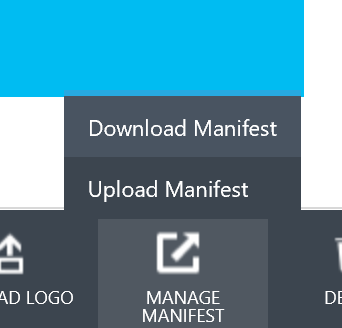 You will need to enable the OAuth2 implicit grant by downloading a manifest file and editing some JSON. 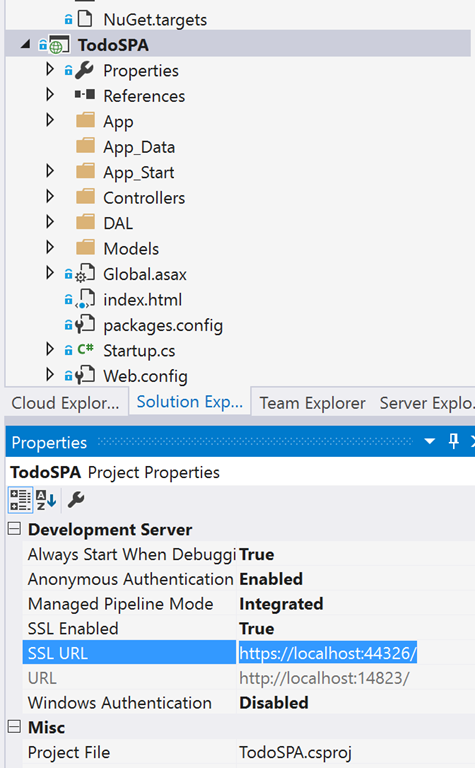 The last configuration step is to update some settings on the Todo SPA code project. And that is all you will need as far as configuration is concerned for this example. 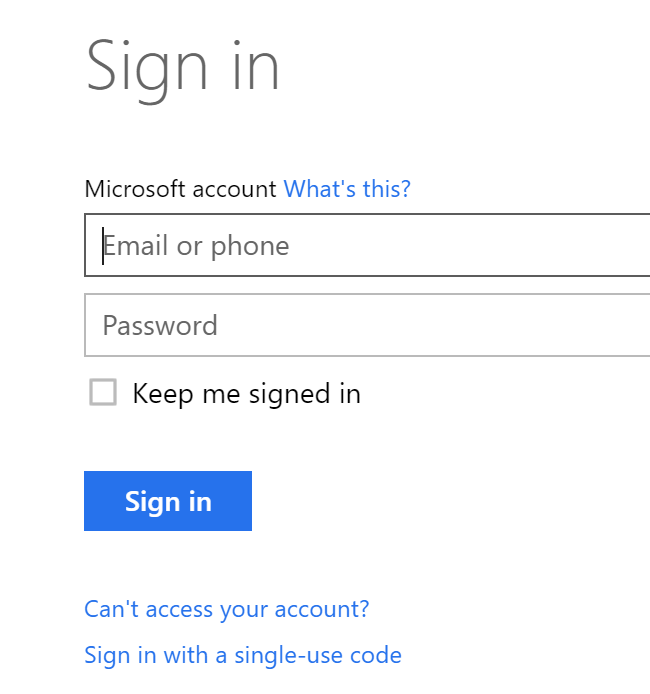 Noticed that the ‘Login’ changed to ‘Logout’ once you go through the sign-in process and become an authenticated user of the application. You might feel that this is quite a bit of configuration for securing applications, and I wouldn’t blame you. However, security as you already know is hard, and even though these steps may seem like a lot at first, they are also necessary to keep things locked down. In the words of Mr. Bertocci, Microsoft’s plan for Azure AD is to create “…the BEST identity system for ALL developers.” And I would agree that so far the journey has been quite fun, and I look forward to diving in more deeply into the realm of Azure AD and security in general.